This Hawk 75 was used by the Royal Norwegian Air Force (RoNAF) in the advanced training camp at Little Norway in Toronto, Canada during WWII. The 30 planes ordered were originally planned for deployment in Norway, but were redirected to Little Norway due to the German invasion in 1940. After serving in Little Norway the Hawk 75's were returned to the USAF and designated P-36G's. 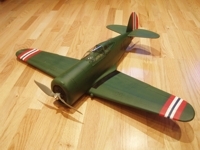 This model depicts aircraft number 447 as used at the RoNAF training camp in Canada.